The Tanoshiboy Chronicles: Design & Illustration Blog: Hulk vs. 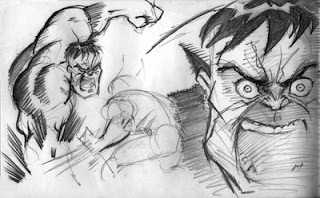 I was watching the Hulk vs. movie last week and it got my pencil moving. Both flicks were great. So I started sketching for a few minutes while my web access was being worked on. I'd change a few things here, but I gotta stop thinking about the exercise of sketching as a proof of perfecting drawings and more as a becoming a more perfect artist (which I have a long way to go). Check out the movie (he fights Wolverine & Thor). Enjoy the sketch. Labels: hulk, marvel comics, Superheroes, vs.